The spread of opinions, memes, diseases, and "alternative facts'' in apopulation depends both on the details of the spreading process and onthe structure of the social and communication networks on which theyspread. One feature that can change spreading dynamics substantiallyis heterogeneous behavior among different types of individuals in asocial network. In this project, we explore how anti-establishmentnodes (e.g., "hipsters") influence spreading dynamics of two competingproducts. We consider a model in which spreading follows adeterministic rule for updating node states (which describe whichproduct has been adopted) in which an adjustable fraction of the nodesin a network are hipsters, who always choose to adopt the product thatthey believe is the less popular of the two. The remaining nodes areconformists, who choose which product to adopt by considering onlywhich products their immediate neighbors have adopted. We simulate ourmodel on both synthetic and real networks, and we show that thehipsters have a major effect on the final fraction of people who adopteach product: even when only one of the two products exists at thebeginning of the simulations, a very small fraction of hipsters in anetwork can still cause the other product to eventually become morepopular. Our simulations also demonstrate that a time delay in theknowledge of the product distribution in a population, as compared toimmediate knowledge of product adoption among nearest neighbors, has alarge effect on the final distribution of product adoptions. Using alocal-tree approximation, we derive an analytical estimate of thespreading of products and obtain good agreement if a sufficientlysmall fraction of the population consists of hipsters. In allnetworks, we find that either of the two products can become the morepopular one at steady state, depending on the fraction of hipsters inthe network and on the delay of the knowledge of the productdistribution in the total population. Our simple model and analysismay help shed light on the road to success for anti-establishmentchoices in elections, as such success and qualitative differencesin final outcomes between competing products, political candidates,and so on can arise rather generically from a small number ofanti-establishment individuals and ordinary processes of socialinfluence on normal individuals. 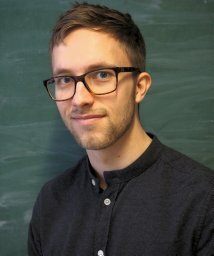 Jonas S. Juul is a Ph.d. Student from the Biocomplexity Department, Niels Bohr Institute, Copenhagen. He has a background in physics but has worked on projects in "pure" mathematics (graph theory) at the Weizmann Institute of Science and applied mathematics (spreading processes on networks) at the University of Oxford. At the Niels Bohr Institute he works on systems of coupled oscillators in biology, and understanding friendship and networks structures from the social interaction of 1000 freshman students at a large university. The work he will be presenting was done with Mason A. Porter (UCLA and University of Oxford). Jonas is visiting Boston this week.